A Look at Ingrid Goes West | What Else is on Now? We live in an age where most of us are glued to our phones or computer screens. Whether intentional or by accident, our continuous obsession over social media has brought us together just as much as it’s kept us isolated from one another. Our validation comes as much from likes on a Facebook or Instagram photo as it would from an in-person conversation or a phone call for those who use their phones as phones. And it’s a trend that doesn’t seem to be going away anytime soon, nor will some of us be any less cynical about it. 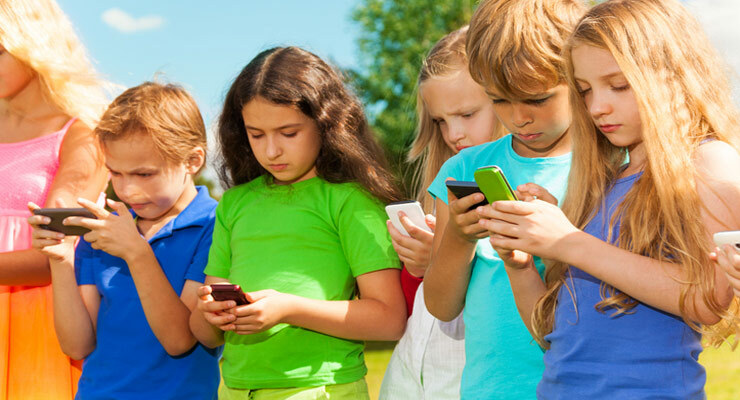 More and more kids nowadays have access to their own smart phones years before some of us did in our youth, people are paid for simply posting something on Instagram- no matter how inane- and somehow, one of the best ways to get a message across seems to come through giving it a hashtag. Wow. Director Matt Spicer knows just what world we live in and it’s thanks to this film’s direction and writing, coupled with a very strong lead performance from Aubrey Plaza, that he managed to craft such a great film. I think what’s so great about Ingrid Goes West isn’t just how accurate the film it is, but its accessibility. It’s a film made for folks who want a good comedy or satire, but the movie also has slower, more serious moments for those interested in a bit of drama. 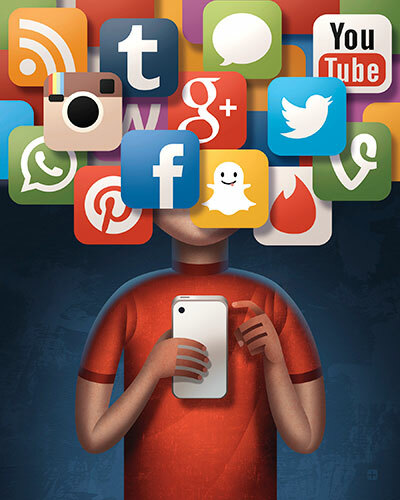 It’s a movie for those who do live their lives vicariously through social media, but it’s also accessible for people who are more derisive about social media, such as myself. In that regard, Ingrid Goes West is an accessible film, but for those who love to hashtag everything or share the details of their Sunday brunch on Instagram, this film isn’t here to validate that social media passion. More like he’s turning it on its side to show what happens when we take our love of social media too far to the level of a maddening addiction. At its best, Ingrid Goes West is a strong example of what happens when social media dictates our lives, rather than us having control over our desire for likes and comments on pictures we post. It lets us see the thought process of an individual who has a strong need for acceptance from strangers and will go to extreme lengths for that validation that they so desperately crave. It’s a very thought-provoking film, this one, and a lot of the message that this film is getting at comes through it’s great humor. I didn’t expect to laugh at a person who is, for all intents and purposes, a stalker. It reminded me of what’s so great about the connections we make through social media, but also how our inability to disconnect has made real-life interactions all the more awkward. When I finished the film, I felt like I’d just watched a documentary on what happens when your love of social media rules you. But this film isn’t an indictment over things like Instagram, Snapchat, or Twitter. Again, these platforms help us stay together when we’re often cities or worlds apart. The downside to this comes when we put online interactions on the same level as real life ones, which is what Ingrid does. Right off the bat, the movie establishes that its protagonist is not a sympathetic or even that relatable of a character. The film begins with Ingrid Thorburn, played by Aubrey Plaza, stalking the Instagram profile of Charlotte, played by Meredith Hagner. Charlotte, turns out is getting married, but Ingrid wasn’t invited. Rather than just accept that and move on, Ingrid crashes the wedding and maces Charlotte in the face. You want to talk about a hook? There’s a great, humorous way to tell us right off the bat how deranged Ingrid is and what lengths she’ll go to when she feels that she’s been slighted. It had me laughing even though I should not be rooting for this woman. What’s worse is we learn later from a wedding guest that Ingrid and Charlotte weren’t friends- Charlotte liked a comment that Ingrid posted online. From the start, we see Ingrid’s unhealthy obsession with social media. Whether she’s eating, in bed, or even on the toilet, she’s got her phone in her hand and likes most, if not all, of the photos she comes across. During this, she learns of a social media guru by the name of Taylor Sloane, played by Elizabeth Olsen. 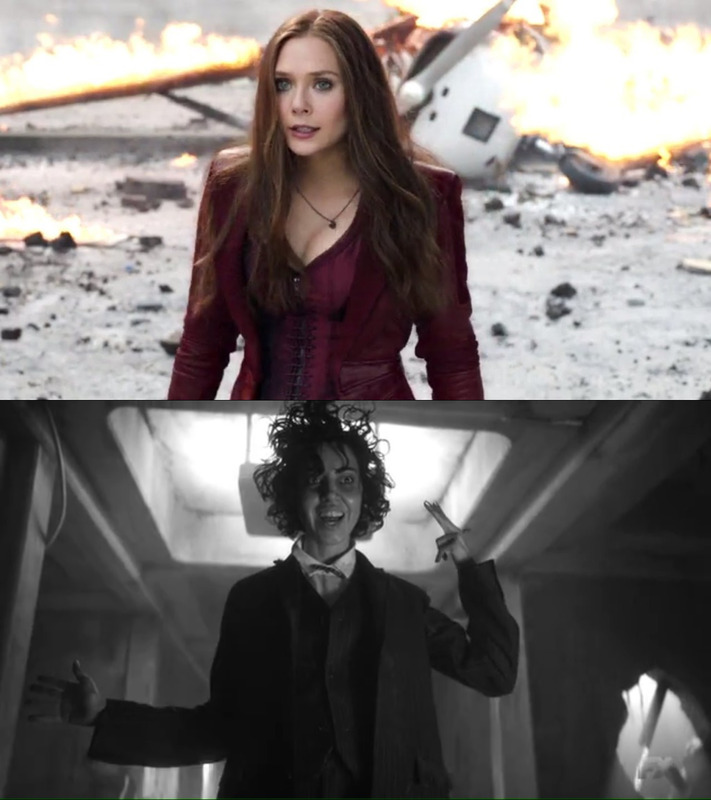 In some alternate world, this is the Shadow King attempting to develop a friendship with the Scarlet Witch. Yes, I went for the easy comic book connection. Anyway, Taylor loves to use Instagram and has a hashtag or emoji for just about every occasion. I feel dirty just saying that. Ingrid gets sucked in and soon comments on one of Taylor’s photos related to a meal she had. It’s minor and chances are these types of people with thousands upon millions of followers don’t have time to respond to each, individual comment. That’s not to say they don’t. For example, I sometimes look at the Instagram page of Lana Condor, the actress who played Jubilee in X-Men: Apocalypse. And on occasion, she responds to what fans post on her page. Same happens with famous folks who respond to comments on Twitter. In this instance, Ingrid is surprised when she receives a response from Taylor. Now, was this from Taylor herself? Someone handling her account? We don’t know, but this one response, which suggests that Taylor and Ingrid should hopefully meet up in Los Angeles, gives Ingrid a bit of validation that she craves. And having received a $62,000 inheritance from her deceased mother, Ingrid packs up and goes west in the hopes of befriending a stranger. Who does this? Who uproots their entire life on a whim in the hopes of becoming best buddies with a person they’ve never met, based on as something as inconsequential and unimportant as a comment on an Instagram photo? Ingrid does, and it’s as illogical as it sounds, but the film has established how unstable Ingrid is, and this is just the start. But you can’t just take a bag of cash from Pennsylvania to California without a solid game plan. Ingrid doesn’t have one, so she ends up renting a place. The landlord in question is Dan, played by O’Shea Jackson Jr. I instantly like Dan not just because of Jackson’s performance, but his aspirations. He’s a screenwriter and hopes to write films. More than that, he’s an avid Batman fan. Well, let me amend that. 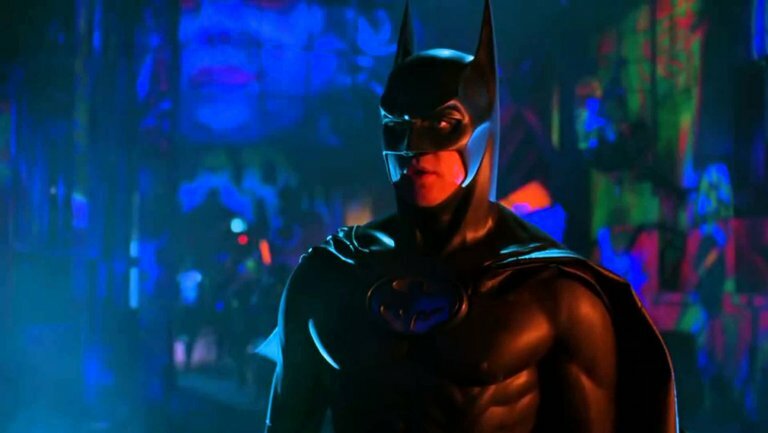 Yes, he loves Batman, but he has a particular interest in Batman Forever. Huh. Of all the Batman films he focuses on, he picked this one. It’s not a deal breaker, but did give me pause at first. So with Ingrid settled in, she begins the unhealthy task of stalking Taylor’s Instagram page just to copy every single thing she does. Certain hairstyle? Food? Taste in art? Particular purse? What Taylor loves, Ingrid now loves. But all this stalking does nothing if Ingrid is unable to get close to her prey, which she does by stealing her dog and later returning it when Taylor realizes her dog is missing. And that’s how you get in the door. It’s also here that Ingrid meets Taylor’s husband, Ezra, played by Wyatt Russell, who is an artist. And his art extends to taking already existing pieces and placing hashtags on them. Unlike Taylor, Ezra is a technophobe because, as he says, certain aspects of his life should be kept private. Ezra would be a great reviewer of this film. Plus, Ezra’s words speak to our need for so much transparency on social media. We have a tendency to put everything out in the open. There’s no need to share every waking facet of your life with the world. I’m sure people love getting likes and hearts when they share pictures of their children or some big achievement, but after a few seconds, that thrill is gone and life continues. While it’s humorous to watch Ingrid and Taylor’s slow friendship build, amidst all this camaraderie is a darker undertone as Ingrid inserts herself into every facet of Taylor’s life. She snaps photos of the drug cabinet in Taylor’s bathroom, and when the two are resting side-by-side, Ingrid can’t help but take a couple of selfies, even though Taylor is asleep. 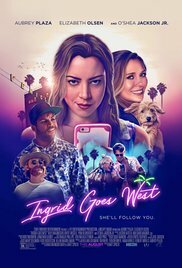 Although Ingrid Goes West is a commentary on our obsession with social media, it’s just as much about the people who obsess over it. On their own, there’s not a ton wrong with social media platforms, but at the end of the day, it all boils down to the individual’s usage and how much time they spend buried in Instagram photos or Facebook photo filters. Ingrid is the polar opposite of a character like Gloria Burgle on Fargo. There, Gloria doesn’t use Facebook, nor does she understand its usefulness versus an in-person conversation. And it’s her aversion to using sites like Facebook that make her virtually untraceable. She’s old-fashioned that way. But Ingrid puts it all out there. Granted, her social media presence is all a facade, but she creates a virtual paper trail that could get her into trouble, were her intentions to fall into the wrong hands. I’m impressed with how Plaza and Olsen’s performances are so similar to people stuck on their phones without it feeling phony or too over-the-top. Apparently, prior to this film’s release, neither of them even had Instagram. In an interview on The Washington Post, Plaza states how she had a phone at all times to get sucked into looking at feeds. But not in real life because, as she says, she has self control. Though the same can’t be said for some of us in real life, even myself at times. If you know someone that takes a photo, posts a Facebook status, or tweets about almost every mundane thing in their life, whether for validation or otherwise, then you know an Ingrid. While it lasts, the friendship, disingenuous as it is, between Ingrid and Taylor is believable at times and were Ingrid not so awkward and a stalker, there could be room for a genuine friendship. As is, Ingrid preys on the niceness of others. She borrows Dan’s truck for a road trip and not only doesn’t return in time, but damages it when she and Taylor are high on cocaine. But it’s with Taylor that Ingrid thinks their supposed friendship means more than what it is. When Taylor confides in Ingrid, she in turn believes that this is an exclusive secret, never mind that there’s nothing stopping Taylor from sharing this news with anyone else. Anytime another friend or acquaintance enters the scene and gets Taylor’s attention, Ingrid becomes jealous, as if she has exclusive access to Taylor. At the very least, Ingrid doesn’t lash out at anyone who dares infringe on her bonding time with Taylor, but there’s a seething glare in Plaza’s eyes that shows not just how far off the deep end Taylor is, but how she can’t fathom the mere thought that she’s not the center of Taylor’s universe, even though this connection started off of nothing more than an Instagram response. This doesn’t mean that this is an amicable friendship from Taylor’s point of view, either. Olsen makes Taylor come off as sweet and charming, but also someone with a million and one things on their busy schedule of posting Instagram pictures. She sees Ingrid as a friend, if even that, but they’re not married. Nor does Taylor ever have any expectations of this stranger who just popped up in her life. Plus, the two are not compatible. Taylor has friends, family, and wide influence. Plus, she has aspirations for her future. Ingrid’s goal is to just be loved, as if she’s lived the bulk of her life as a social pariah. I mean, we do see her in a mental hospital after she maces Charlotte, so it’s evident that she has some key issues that need work. And don’t expect her to resolve those issues by film’s end. Despite this, the film emphasizes that Ingrid’s actions are not to be emulated. She’s not someone who should garner sympathy and even when there are moments when you think the film is going to get on her side, it points out that no, Ingrid is the one with real issues, as what seems like innocent intentions mask the fragile psyche of a very disturbed individual. It’d be like watching Hard Candy and sympathizing with Jeff after all the psychological torture that Hayley puts him through, even though he’s a predator and still solicits her when she’s not of age. Not that Hayley doesn’t do some batshit crazy stuff herself, but she’s trying to prevent another wrong by stopping Jeff. And I don’t know how I managed to bring Hard Candy into this conversation. And that was a 2005 film, before there was any semblance of a social media boom. While Ingrid Goes West may not reinvent the wheel as far as showing us deranged individuals, it does present a new X factor by bringing social media obsession into the equation. There’s a bit of a tone shift once Taylor’s brother, Nikki, played by Billy Magnussen, enters the film, but it doesn’t break the film’s flow. Ingrid Goes West takes our current obsession with social media and holds it up to a cracked mirror. Plaza’s strong lead role invites us into the mind of a sociopath, but you may see a little bit of her in yourself if you love staying glued to that phone of yours. Sometimes, it’s best to put the phone down and go enjoy real life. But before you do, don’t forget to like, comment, and share this half-assed review. Hashtag intentional. This entry was posted in Film and tagged Aubrey Plaza, Billy Magnussen, David Branson Smith, Elizabeth Olsen, Harley Chung, Ingrid Thorburn, Matt Spicer, Meredith Hagner, Nicky Sloane, O'Shea Jackson Jr, Pom Klementieff, Taylor Sloane, Wyatt Russell by omarid513. Bookmark the permalink.